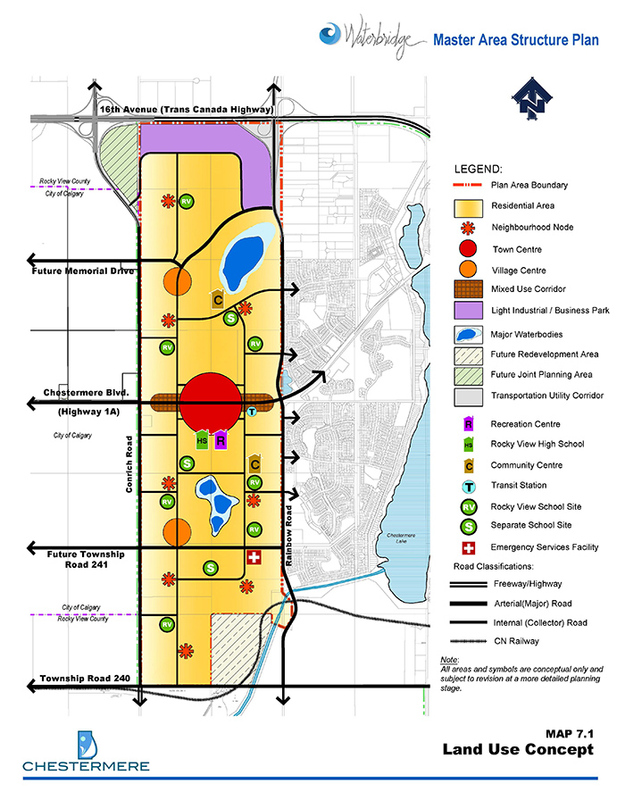 On behalf of a consortium of landowners, B&A Planning Group developed a Master Area Structure Plan (ASP) for a 2400 acre parcel of land called Waterbridge that was annexed into the City of Chestermere from the City of Calgary in 2009. B&A ensured the Master ASP aligned with the City’s Municipal Development Plan and Vision for the development of a distinctive, sustainable and recreational-based area. It also provided the blueprint to guide the preparation of more detailed Area Structure Plans for the residential communities, town centre, and Business Park that would comprise Waterbridge. A transparent planning process for the Master ASP was developed to ensure stakeholders were engaged and informed. Workshops, meetings, public events and a project website helped to enable collaboration and effective communication. In addition to a collaborative planning process, the Waterbridge Master ASP was prepared in two Parts to help facilitate a better understanding of the Master ASP policies. Part 1 was the Plan Evolution and Part 2 was the Policy. The Plan Evolution walks the reader through how both the physical land and existing policies were analysed, the constraints and opportunities identified, and set the stage for how the policies (Part 2) were developed. B&A achieved approval of the Master ASP in February 2014.